We are pleased to announce Azure Media Services now offers the ability to protect both Video-On-Demand (VOD) and Live Streams with Widevine Modular DRM technology. 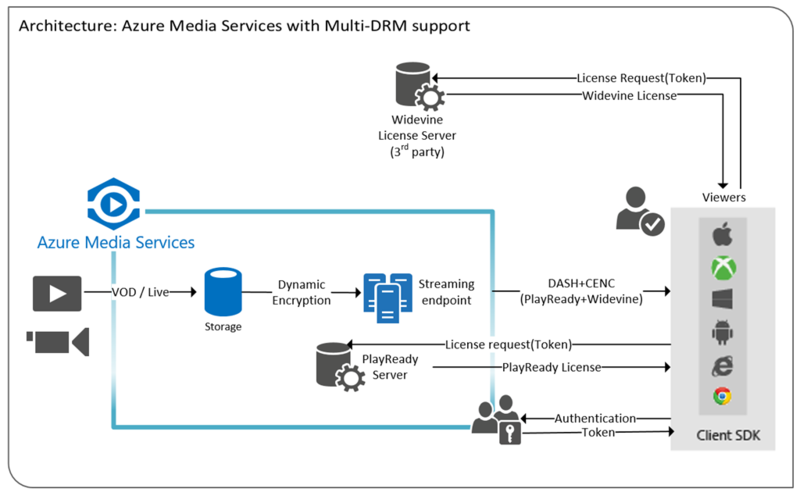 Widevine protection together with Microsoft PlayReady DRM packaging capability, now enables you to reach even more end points with protection for premium content using a single streaming end point in Azure Media Services. We also updated Azure Media Player to playback Widevine protected content using Encrypted Media Extensions (EME) so you can stream securely to Chrome and Android devices using HTML5 Video. Along with the capabilities around encryption we are also announcing two new partners that offer multi-DRM license delivery services (including support for Widevine). Together with these partners Azure Media Services provides you an easy way to deliver your premium content to even more end points. Microsoft is constantly innovating for customers to deliver content anywhere, anytime possible, including DRM protected premium content. Microsoft is embracing international standard MPEG-DASH streaming with Common Encryption (CENC) and multiple-DRM, in order for your content to be played across devices and platforms. Azure Media Services platforms allow you to encrypt your stream only once, apply different DRM headers and our player could decrypt the same file using different DRM systems based on the capability of the platform. The diagram below demonstrates how it works in Azure Media Services. Sign up with Azure.com and create an Azure Media Services account. Configure your asset to be DRM protected with dynamic encryption. This MSDN tutorial will help you prepare a DASH stream with a multiple DRM header. We added a new enum value in Asset Delivery Policy to include Widevine packaging. By adding this one line of code, you are all set to deliver Widevine protected content, if you are already using dynamic encryption in AMS. Configure your Widevine License server. Azure Media Services offers Widevine License delivery services with our partners. With our announcement today, we now have three partners in this space to help you deliver Widevine licenses. Configure Azure Media Player for your Widevine streams. Please contact me at yanmf@microsoft.com if you have any questions.